The Amphitheater at Coney Island Boardwalk revealed the first wave of the 2016 inaugural summer lineup including a Grand Opening weekend performance on July 3rd with Sting & Peter Gabriel who have already sold out summer performances along their Rock Paper Scissors tour including Madison Square Garden and Nikon at Jones Beach Theater. Rounding out the venue’s Grand Opening will be the stars of truTV’s hit series Impractical Jokers on July 1st and Rock & Roll Hall of Famers The Beach Boys performing on July 4th. Tickets for Rock Paper Scissors, July 3rd at the Amphitheatre at Coney Island Boardwalk go on sale Friday, April 15th at 10:00 am at www.livenation.com. The artists’ fans will have access to a pre-sale through their respective official websites, starting Monday, April 11th at 10:00 am. If you are not currently a member of Sting.com click here to join and take part in the Sting.com presales! Citi cardmembers will have access to presale tickets for the Coney Island starting Tuesday, April 12th at 10AM local time through Citi’s Private Pass Program. For complete presale details visit www.citiprivatepass.com. 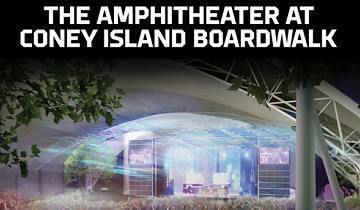 The Live Nation operated amphitheater will host a wildly diverse summer concert series and will bring some of the biggest names in music to Coney Island, including performances by ultimate rocker’s Jane’s Addiction, founding Eagles member Don Henley, R&B powerhouse Jill Scott, legendary rock band Boston and many more. Additional shows will be announced in the coming weeks. For up to date lineup information please visit www.ConeyIslandLive.com. A Citi® cardmember pre-sale runs Tuesday, April 12 through Thursday, April 14th Citi Private Pass®. For complete pre-sale details, visit www.citiprivatepass.com. Tickets go on sale to the public beginning Friday, April 15 at 10am through www.coneyislandlive.com. The Amphitheater at Coney Island Boardwalk is a 5,000 seat covered open air venue, the first of its kind in the tri state area, and will host a variety of concerts, family, shows, sports, comedy & multicultural events and become the new permanent home of the free Seaside Summer Concert Series. The Amphitheater is being developed by iStar, in partnership with Coney Island USA and serves as a key part New York City’s larger commitment to investing in and revitalizing Coney Island community. Live Nation will operate the venue in a partnership with Legends and Brooklyn Sports & Entertainment. 15-Jul Jane's Addiction with Dinosaur Jr.